Introduce adjective vocabulary to students first. After students have learned different adjectives ask random questions using pre-learned vocabulary. Is a lemon sweet or sour? Who is late every day? 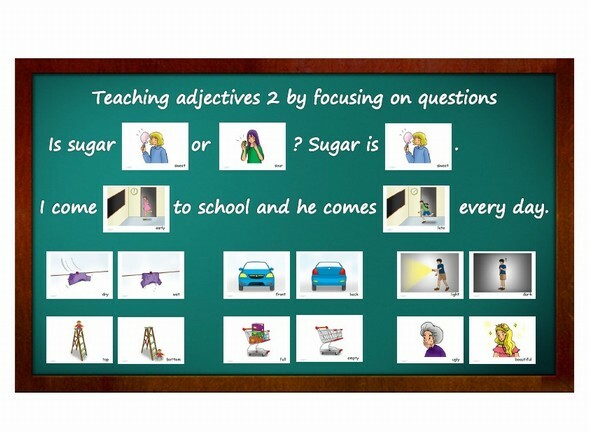 e.g.. You can also choose objects and students to have describe the objects using adjectives and pre-learned vocabulary. Silent Game (ideal for groups from 8-16 students) - Divide students into 2 teams. Line up the chairs facing the whiteboard, so if you have 12 students you make 2 rows of 6 chairs. Students must sit behind each other and it is prohibited to turn their head backwards or to speak at all. Give a fly swatter to the students who sit in front of the board. Teacher sits between the 2 rows in the back. Teacher whispers an adjective into the ears of two students, these students have to lean forward and whisper that word to the next, until it reaches the front student (like broken telephone). The front student must hit the opposite flashcard. Fastest team gets a point (playable also without speaking, best used for teaching feelings, opposites and adjectives). 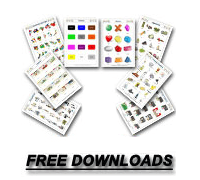 Using Bingo - The teacher calls out various adjectives. If a student has the opposite of the adjective called, he/she can cross the word off their bingo card.